BY W[ILLIAM]. A. FLANIGAN, COMPANY G, FIFTEENTH GEORGIA INFANTRY. 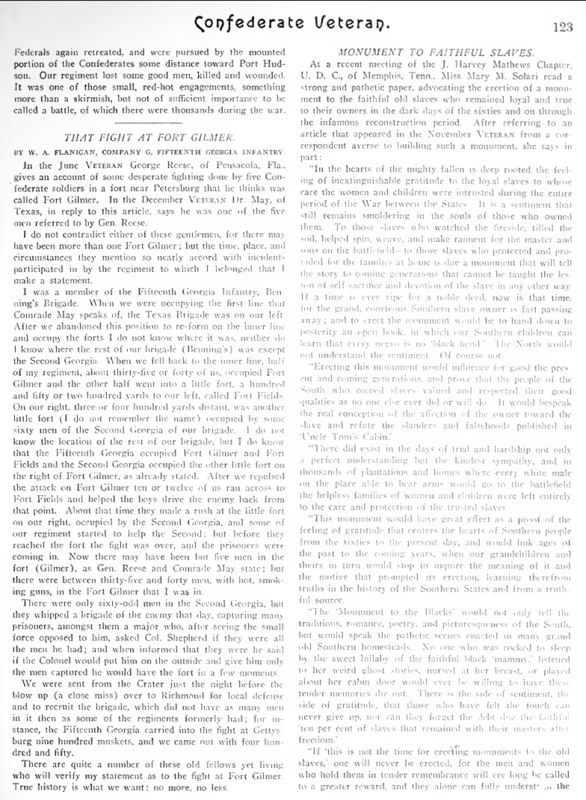 In the June VETERAN George Reese, of Pensacola, Fla., gives an account of some desperate fighting done by five Confederate soldiers in a fort near Petersburg that he thinks was called Fort Gilmer. In the December VETERAN Dr. May, of Texas, in reply to this article, says he was one of the five men referred to by Gen. Reese. I do not contradict either of these gentlemen, for there may have been more than one Fort Gilmer; but the time, place, and circumstances they mention so nearly accord with incidents participated in by the regiment to which I belonged that I make a statement. I was a member of the Fifteenth Georgia Infantry, Benning’s Brigade. When we were occupying the first line that Comrade May speaks of, the Texas Brigade was on our left. After we abandoned this position to re-form on the inner line and occupy the forts I do not know where it was, neither do I know where the rest of our brigade (Benning’s) was except the Second Georgia. When we fell back to the inner line, half of my regiment, about thirty-five or forty of us, occupied Fort Gilmer and the other half went into a little fort, a hundred and fifty or two hundred yards to our left, called Fort Fields2. On our right, three of four hundred yards distant, was another little fort (I do not remember the name)3 occupied by some sixty men of the Second Georgia of our brigade. I do not know the location of the rest of our brigade, but I do know that the Fifteenth Georgia occupied Fort Gilmer and Fort Fields and the Second Georgia occupied the other little fort on the right of Fort Gilmer, as already stated. After we repulsed the attack on Fort Gilmer ten or twelve ten or twelve of us ran across to Fort Fields and helped the boys drive the enemy back from that point. About that time they made a rush at the little fort on our right, occupied by the Second Georgia, and some of our regiment started to help the Second; but before they reached the fort the fight was over, and the prisoners were coming in. Now there may have been but five men in the fort (Gilmer), as Gen. Reese and Comrade May state; but there were between thirty-five and forty men, with hot, smoking guns, in the Fort Gilmer that I was in. There were only sixty-odd men in the Second Georgia4, but they whipped a brigade of the enemy that day, capturing many prisoners, amongst them a major who, after seeing the small force opposed to him, asked Col. Shepherd if they were all the men he had; and when informed that they were he said if the Colonel would put him on the outside and give him only the men captured he would have the fort in a few moments. We were sent from the Crater just the night before the blow up (a close miss) over to Richmond for local defense and to recruit the brigade, which did not have as many men in it then as some of the regiments formerly had; for instance, the Fifteenth Georgia carried into the fight at Gettysburg nine hundred muskets, and we came out with four hundred and fifty. There are quite a number of these old fellows yet living who will verify my statement as to the fight at Fort Gilmer. True history is what we want; no more, no less.